A primary school has banned football after a outbreak of diving and play-acting inspired by Brazil’s Neymar. The Brazilian striker is one of a number of players accused of simulating fouls and going down too easily in the World Cup. The beleaguered headteacher of Home Farm School in Colchester, Essex says a rash of youngsters copying him has led to a need for a school to go back to the rules of the game. Richard Potter said: ‘Many of the children were reenacting diving and emulating the trained, professional players they had seen. ‘These are four to 11-year-olds who are trying to emulate the older players. This was causing a lot of arguments. He says during the week’s ban the pupils will be sitting with the teachers and will write their own rules for a fair match. 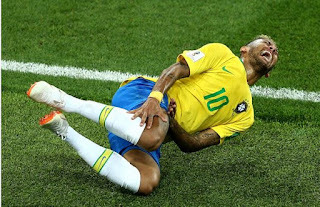 The head teacher is not the only one to criticise Neymar, who was widely ridiculed for rolling around on the floor after a Mexican player stood on him in Brazil’s last-16 tie. His behaviour sparked a series of mocking memes, with even Brazil’s boss Tite saying he was giving a bad example to children.